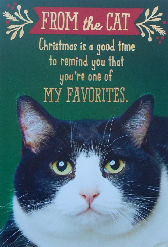 This Christmas cards if from the Cat. Christmas is a good time to remind you that you're one of MY FAVORITES. Inside greeting: You rank up there with catnip, tuna and stuffed toy mice! This card is 5 3/8" wide x 8" high. Red envelope included.